Why buy a dlp projector? A DLP projector is the best choice on the market offering competitive pricing and superior technology. Enjoy crisp, clear visuals with colors that pop along with easy of use with your DLP purchase. 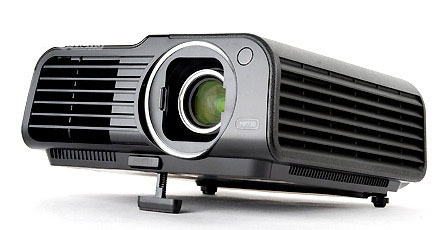 Here are the top 5 reasons to purchase a DLP projector. Due to the technology using millions of tiny mirrors reflecting colors, video and graphics are sharper. The mirrors spaced less than a micron apart means there are fewer gaps between pixels so images are smooth with a film-like quality. You won’t see the pixilation effect that is present in LCD projectors. The DLP projector also has sealed optics making them better suited for dusty environments. DLP projectors deliver the highest available resolution – over 2 million pixels at 1920 x 1080. This translates into a full HDTV experience with outstanding picture and quality for either work or leisure viewing. With a DLP 1080p Projector you can experience the best HDTV programming, Blu-Ray discs, or video games available. DLP projectors have a technological advantage over LCD projectors due to their sophisticated color wheel. DLP retain color accuracy because they simply reflect light onto the screen producing a crisp, clear and brilliant picture. Since there is no color decay or decreased legibility over time, your DLP projector will last for years. DLP Projectors provide a clear, sharp picture due to the high black and white contrasts. Most DLP projectors have contrast ratios of 2000:1—higher than most LCD projectors. Deeper blacks and more brilliant whites mean text is extremely readable—especially important in presentations that are text heavy presented in rooms with ambient light. DLP are small and compact due to their light engine with a single chip. Many weigh in at three-pounds or less making them very portable—especially important for business travel. They’ve been designed for easy set-up and quick connections to your computer.